On the SalesData sheet, there is a named table -- Sales_Data -- that contains sales records. Each record has an order date, and that field will be used to calculate the fiscal year and fiscal month. This table is the source data for both pivot tables. On the Lists_FY sheet, there are formulas and named ranges used in calculating the fiscal year. There is also a cell where you can enter the month number in which the fiscal year starts. 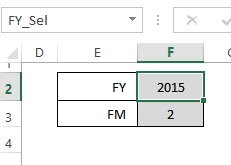 In this example, the fiscal year starts in April, so 4 is typed in cell B2 -- that cell is named FYStart. 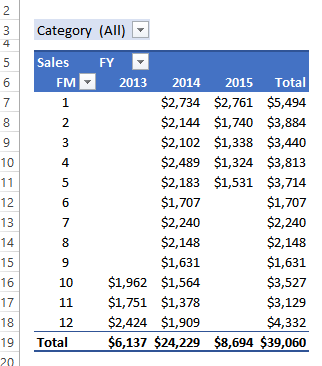 In the first pivot table, the total sales are shown for each fiscal year and month. 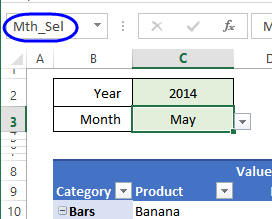 New columns are added in the source data, then those fields are used in the pivot table. After the fiscal year start month has been entered, you can calculate the fiscal year. The year is calculated, based on the order date. To calculate the fiscal month, there is a lookup table. The fiscal months can be manually entered, or use a formula, for more flexibility. Then, a fiscal month calculation will be added to the source data. On the Lists_FY sheet, there is a list of months, with 3 columns -- Month, Month Number, and Fiscal Month Number. The fiscal starting month is highlighted in the screen shot below. The month table will be used as a lookup, for a Fiscal Month column in the SalesData sheet. The first two columns are manually entered, and the fiscal months could also be manually entered. In the sample file, the third column is a formula, so it will automatically adjust if the Fiscal Year start month is changed. 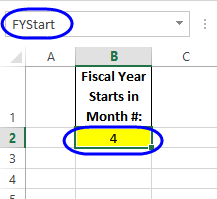 The formula compares the month number, to the FYStart month. If the month number is lower, 12 is used, otherwise zero is used. Then, the FYStart month is subtracted from the month number, and 1 is added. The month number is 1, which is less than the FYStart month of 4, so the first part of the formula returns a 12. In the second part of the formula, the month number, 1, has the FYStart (4) subtracted, and one is added. The result is minus 2. Combine both parts of the formula, and the result is 12 - 2 = 10, so January is fiscal month 10. After the months lookup table has been built, you can calculate the fiscal month in the source data. 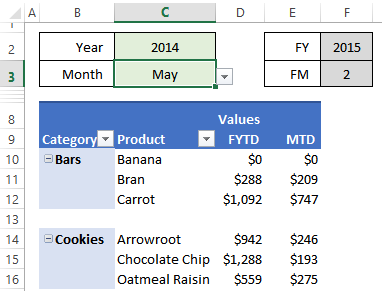 After you calculate the fiscal year and fiscal month, you can use those fields in a pivot table, to summarize the data. Total Price field is in the Values area. Category field is in the Report Filter area. 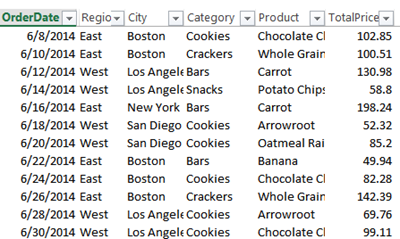 In the sample file, there is another pivot table sheet -- PivotFYTD. Instead of simply showing the fiscal year and month, it shows the fiscal year to date and fiscal month to date amounts, for a selected year and month. 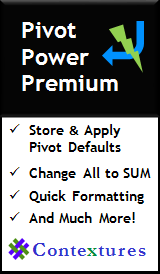 To prepare for this type of pivot table summary, more calculations are added in the source data, and month and year selectors are added to the PivotFYTD worksheet. On the PivotFYTD sheet, there are drop down lists where you can select a year and month. To the right of those cells, the Fiscal Year and Month are calculated. The SUMIFS function will return the amount in the TotalPrice column, if the fiscal year matches the selected fiscal year, and the fiscal month is less than or equal to the selected fiscal month. So, if the selected year is 2014, and the selected month is May, only the amounts from April and May 2014 would be returned, because the fiscal year starts in April. 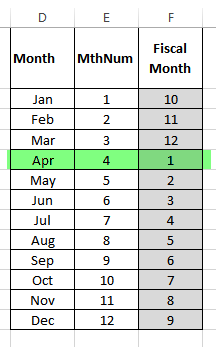 So, if the selected year is 2014, and the selected month is May, only the amounts from May 2014 would be returned, because that is the selected month. If you change the selections in the drop down lists, the formulas in the source data will automatically change, to show the correct FYTD and FMTD amounts. right-click on the pivot table, and click the Refresh command. In the sample file, there is an event procedure that runs when you change the Yr_Sel cell, or the Mth_Sel cell. To see the code, right-click the sheet tab, and click View Code. 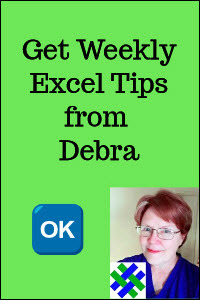 Click here to download the Fiscal Year Pivot Table sample file. It is zipped, and in xlsm format, and contains macros. Enable macros when you open the file, if you want to test the code.